Tip the pilchards into a bowl. Break the fish into chunks in the sauce with a fork. Tip the lentils into a small saucepan and add cold water to cover. Cover the saucepan and bring to the boil. Reduce the heat and simmer for 5 minutes. Set aside for 1 hour to soak. Drain and rinse with cold water. Cook the potatoes in boiling water until soft. Drain well. Heat a few drops of oil in a non-stick pan and fry the onion and garlic until soft. Remove from the heat and stir in the chutney and tomatoes. 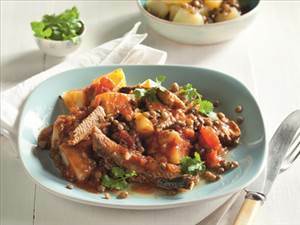 Add the pilchards, lentils and potatoes and season with pepper. Mix everything together gently. Cover and heat through. Serve the breyani with brown rice, poppadums or a big green salad. Garnish with fresh coriander leaves. I am trying this for sure! I love spicy and I love fish, so this recipe rocks!! There are 238 calories in 1 serving of Pilchard Breyani. Calorie Breakdown: 27% fat, 47% carbs, 26% prot.